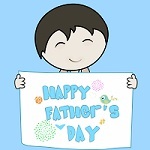 Father's Day is a day to recognize all the wonderful Dads out there. And of course, fathers love a joke and a laugh - they're not called "Dad jokes" for nothing! And so with that in mind, here's a selection of truly hilarious Father's Day quotes. When my kids were younger, I used to avoid them. I used to sit on the toilet until my legs fell asleep. You want to know why your father spends so long on the toilet? Because he's not sure he wants to be a father. ~ Louis C.K.